A decade ago Jacques Torres couldn’t give away hot chocolate. The French-born chef, now known as “Mr. Chocolate,” stood outside of his year-old chocolate shop in Brooklyn, N.Y., with sample cups of the steaming liquid chocolate, and no one wanted it. Once people finally tasted it, the liquid confection quickly took off. Six months later, Torres added Wicked, a Mexican-meets-European-inspired hot chocolate that features chipotle pepper, ancho chile, cinnamon and allspice, to his offerings. His hot chocolate has become so popular that Torres now offers other flavors, including peanut butter, caramel and orange. Hot chocolate has not only grown on Torres’ menu but also at restaurants across the country, now appearing on nearly 22 percent of all menus, according to market research firm Datassential. Growth of the beverage on restaurant menus has remained steady, particularly in the fine-dining and quick-service segments, where it has increased 6 percent since 2007. Shake Shack’s hot chocolate features three types of dark chocolate with simmering cream and milk. New York-based Shake Shack has been offering hot chocolate seasonally since it opened its first store eight years ago in New York’s Madison Square Park. The fast-casual burger chain’s offering features three different varieties of dark chocolate blended with simmering cream and milk. “Shake Shack’s spin on hot chocolate is all about warmth and nostalgia,” said Mark Rosati, the company’s culinary development manager. Chicago-based Forever Yogurt is among the brands that have more recently added hot chocolate to the menu. The chain introduced Froth, a hot chocolate and espresso bar, at its seven stores not long after it opened in 2010 as a way to boost sales during the bitter cold winters in the Windy City. 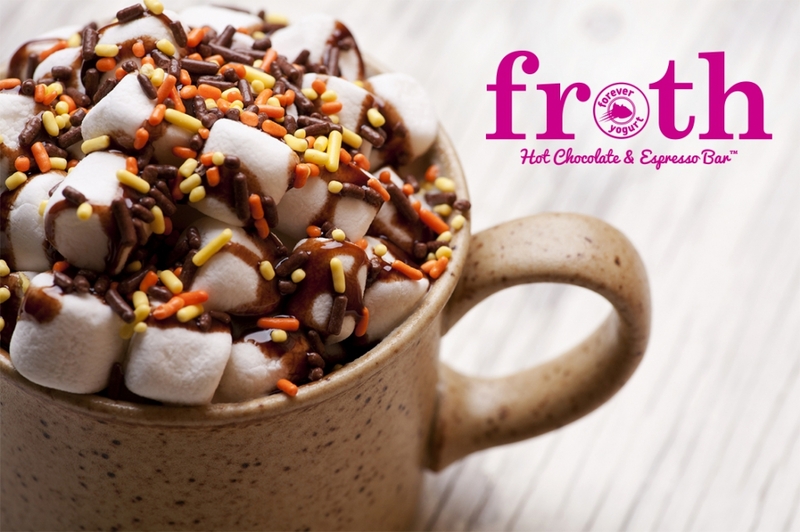 Forever Yogurt introduced a hot chocolate line called Froth to heat up sales during the colder months. “People still come in for frozen yogurt, but we wanted something for people who came in and wanted something hot,” said Ahmad Yilmaz, creative director for Forever Yogurt. To make its hot chocolate, Forever Yogurt melts down ingredients from its yogurt-topping bar and adds the customer’s choice of milk. Among the half-dozen flavors are Steam Engine, made with milk chocolate; P.B. Confidential, made with peanut butter cups; and Nocturnal Owl, a Mexican-inspired hot chocolate made with dark chocolate. Additional flavors are also in the works. The growth in hot chocolate mirrors what’s happening in the chocolate confectionary segment, says Jean Steur of Chocolate Marketing, a chocolate-trend forecasting firm, noting that it’s about comfort, nostalgia and an interest in pure dark chocolate.